May 10th is ‘National Shrimp Day’. Shrimp are absolutely one of my favorite seafood in any form or style. Below are a few recipes for you to try – one or all. Enjoy preparing them and then enjoy eating them. 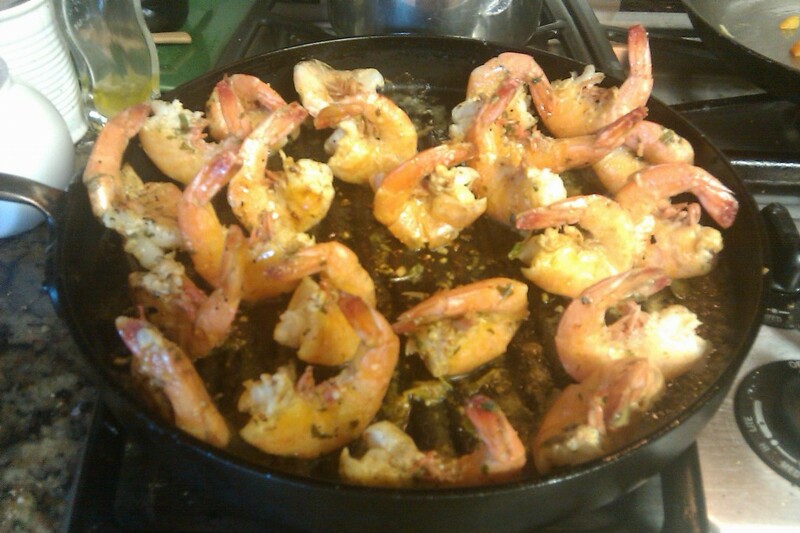 Grilled Shrimp – marinated in Garlic, Basil, Lemon Juice and Olive Oil. These shrimp are delicious as an appetizer, main dish or in a salad. Good for any time, not just National Shrimp Day. Coconut Fried Shrimp – great for a Backyard Luau or any Summer/Spring Meal. Served with an Orange-Lime Sauce. 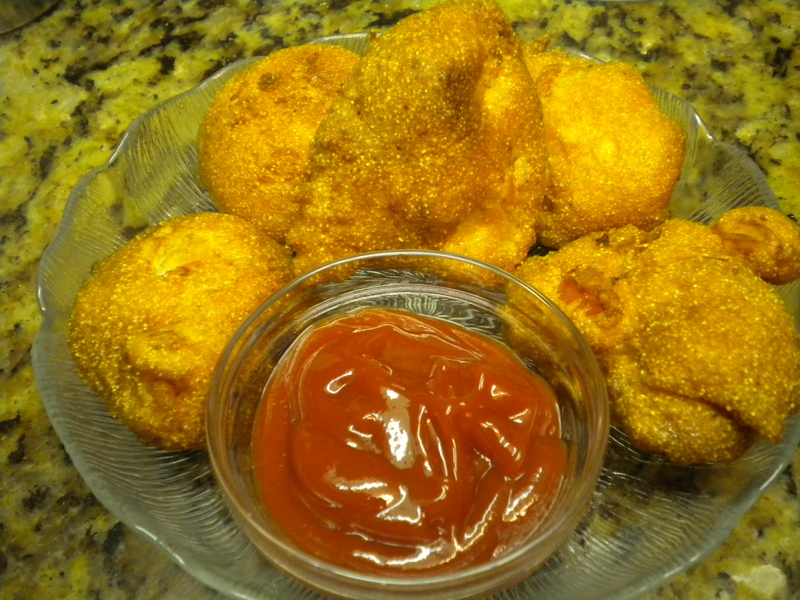 Shrimp Fritters – a delicious and different way to eat Shrimp. 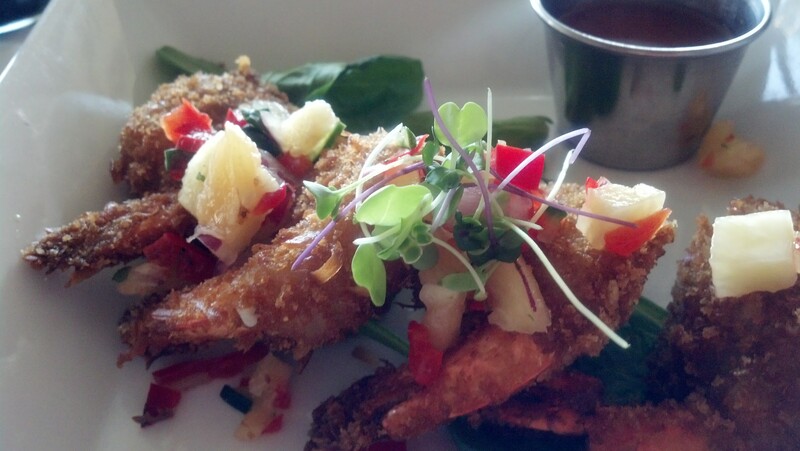 For those of us who love Shrimp and who Fritters, this is the perfect dish. Shrimp Fritters can be served as an appetizer with Cocktail Sauce or as a main dish with a salad and or vegetable. Shrimp Fritters and Cocktail Sauce Enjoy your Shrimp today in whatever way you wish to prepare it, but remember that Shrimp are good any time and any place. So try one or more of these recipes today and save one for another day or month! ENJOY!!! 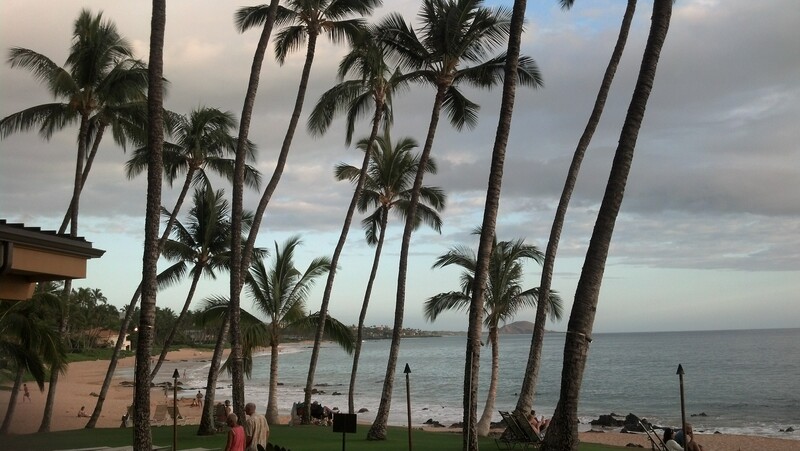 Just about one year ago, I blogged about our Food Odyssey on the Hawaiian Island of Lanai. This year we spent our tropical vacation on Maui and did eat some very good food so I am going to talk about it here and display some photographs. Maybe even give some recipes. Hope you will enjoy this tropical respite. Since we live on the west coast of the United States during the Daylight Savings time we are 3 hours ahead of Hawaiian time or Pacific Standard Time. Our plane left Los Angeles at approximately 8:30 PDT and arrived in Maui at 10:30. Even though we had eaten at the Airport and had some snacks on board, my husband was still up for breakfast. 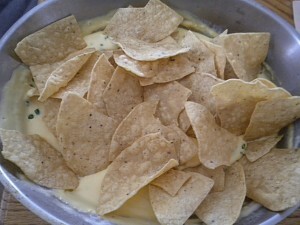 We stopped at the Azeka Plaza and ate our Sunday Brunch at Amigos Mexican Restaurant. Ev had the Banana/Macadamia Nut Pancakes (definitely Hawaiian style) and I had the Shrimp Ceviche. 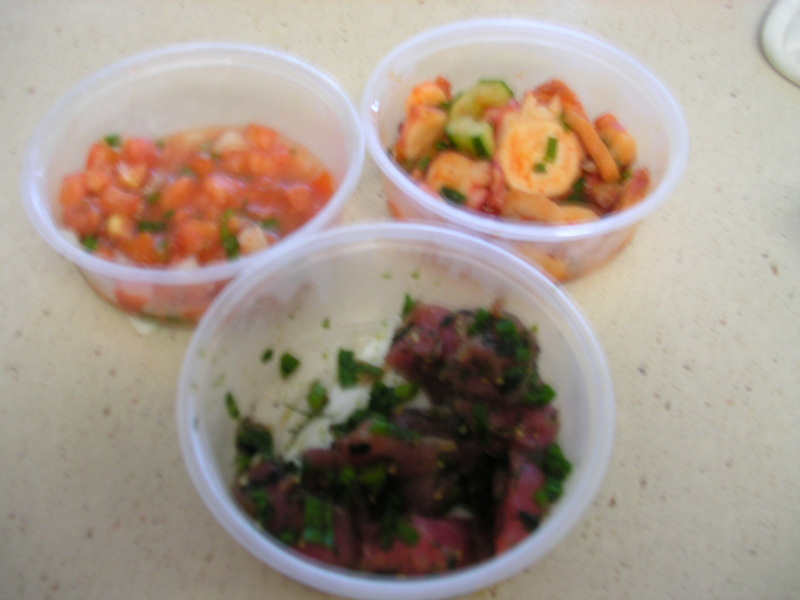 Ceviche is very similar to the Hawaiian Poke (a marinated fish dish) so I really was right in keeping with the tropical food theme. The pancakes huge which made me glad that I didn’t order them because I would only have been able to eat about half. 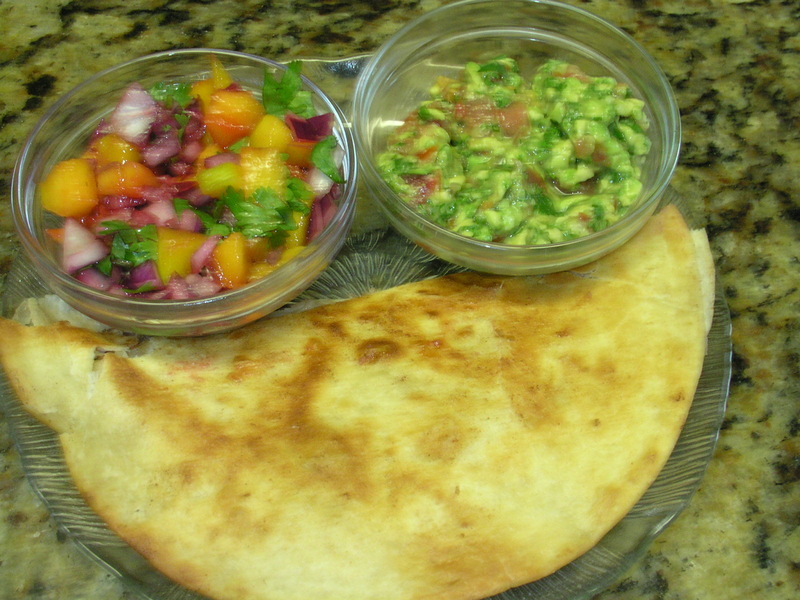 The Avocado Shrimp Ceviche was perfect for me. After eating we went to our Condo Complex and checked in. Fortunately, even though we were early our unit was ready for us. We had a fantastic garden and ocean view with palm trees waving and two fountains operating. After unpacking and resting a while, we went out to pick up some food essentials for our stay here. Before shopping, we decided to eat dinner and ended up in a small place called King’s Chinese Barbecue. 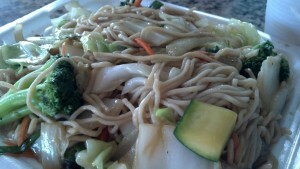 We had delicious Roasted Duck and Vegetable Chow Mein. The seating was outdoors and was right across the street from the beach, so again we had the ocean view and the palm trees waving, even though there were cars driving down the street in front of us. We purchased Blueberry Muffins, Hawaiian Vanilla/Macadamia Nut Coffee, Half & Half, Turbinado Sugar (grown and processed on Maui) and a few other things such as juice and soft drinks. The next day after a Breakfast of Cornflakes and Coffee we went to the Kealia Ponds which have been designated as a bird refuge. One of our major hobbies is ‘birding’ and when in the tropics (or any vacation for that matter) we try and see as many birds as possible. The last time were here, the ponds were half dry, but this time they were quite full. As a result, we saw many more birds this time than we did last time. After our birding venture we drove up to a Tropical Plantation that we like to visit when we are here. One of the reasons we decided to go this day (Monday) because my list of Farmer’s Markets said that they had one on Monday. Wrong, when we got there the sign said Tuesday. No loss though, because we did get to see more birds as there are plenty of ponds in this venue as well as beautiful tropical plantings. They also had a store where we could purchase tropical food items. One of the things which I bought was a bag of Pineapple/Coconut Caramel Corn – this was very yummy! 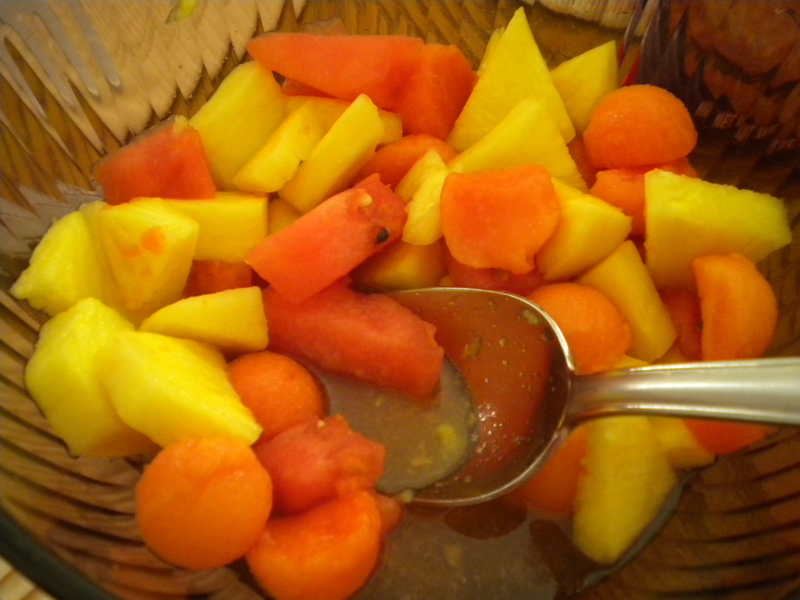 On the way back from the Tropical Plantation we stopped at an ‘Open-Air Market’ on Kihei Road and purchased some fresh Tropical Fruit which included Papaya, Maui Gold Pineapple, Apple Bananas, Baby Jicama and a lime which was almost pink in the middle. 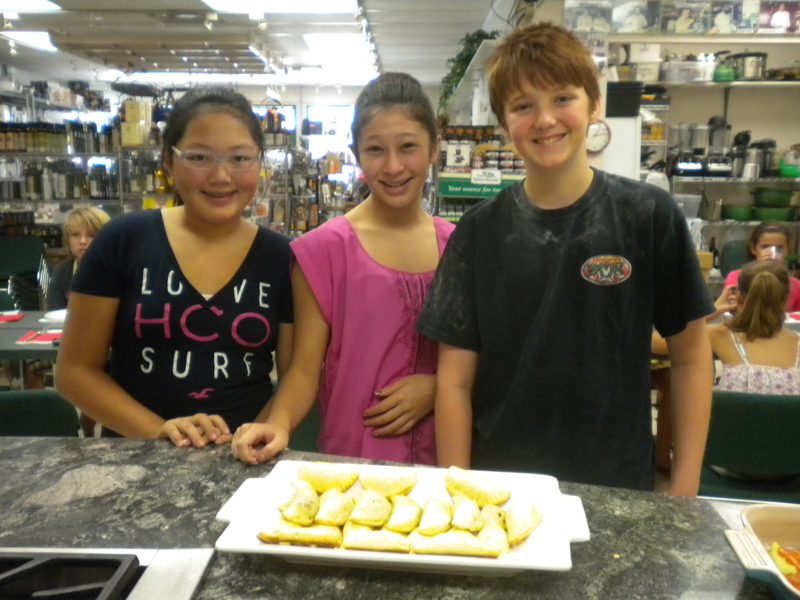 Our next stop this morning was the Market again where we purchased ready-made sandwiches (one thing we noticed this visit is that all the Markets and ABC Stores and Whalers Stores have a very nice Deli Counter and you can get almost anything for any meal. Competition I’m sure the restaurants don’t like) In addition to the sandwiches we purchased Cornflakes which managed to last us most of the 11 days that we were there. For dinner we went to the Five Palms Restaurant which was just down the street from our Condo. Not only was the food delicious but the view was fantastic. In addition to the foregoing they also have a very good ‘Happy Hour’ that lasts from 3PM until 7PM. We got there about 5 PM and since it was so busy and the patio was full we were seated inside and had great comfortable seating and a great view. We ordered California Roll, Coconut Fried Shrimp and Chicken/Lettuce Wraps along with Beverages. Not necessarily Hawaiian Food except for the Shrimp but nonetheless very good. The next day for Breakfast we each had a half of a Papaya filled with cubed Pineapple and sliced Bananas sprinkled with a little Turbinado Sugar and sweet Lime Juice as well as Hawaiian Coffee. To make the Fruity Breakfast simply slice a ‘ripe’ Papaya in half lengthwise, scoop out the seeds (a delicious Salad Dressing – popular in Hawaii can be made from the seeds), squeeze a little lime on the fruit and then fill with fruit of your choice such as sliced Bananas and Pineapples or whatever your preference is. Check back for more on our Maui Food Adventures. 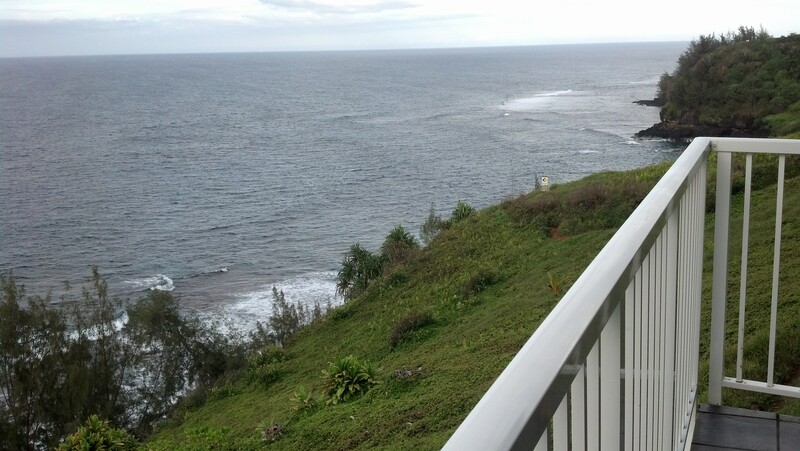 This Spring on our ‘almost yearly’ trip to Hawaii we rented a Condo so that we would have a kitchen so that we could cook the fresh produce and seafood that we were able to purchase at the Farmer’s Markets and Seafood Stores. The following is about the food we purchase, cooked and ate. Let’s start with Breakfast. On several mornings we arose very early to go Birding which is one of our favorite things to do on Vacation. On these days, we just brought along some pastries and drinks but on the days that we slept a little bit later and ate breakfast in the condo, I did cook for at least a couple of them. For one of the mornings, we had a Cinnamon Pull-Apart loaf from Foodland which to our liking did not have enough Cinnamon so I turned it into French Toast. Cinnamon Bread, Egg Bread, Hawaiian Sweet Bread or Brioche make a delicious French Toast product. -french-toast/To make the French Toast, I first sliced the Cinnamon Bread into thick slices and then let it air dry overnight. At Breakfast time, I made a Batter with Eggs, Cream, a little Sugar, Cinnamon and Vanilla. I then soaked the sliced Bread in the Egg Mixture and then fried it in Butter and just a little bit of Oil. The Oil helps to keep the Butter form burning. 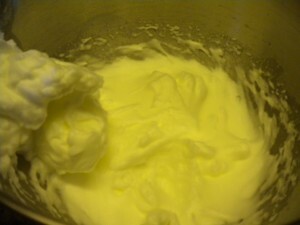 (Oil has a higher smoking point than Butter). 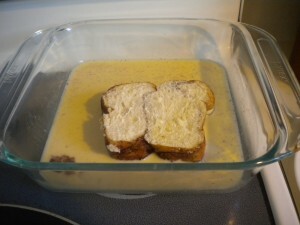 The soaked Bread Slices were cooked in the hot Butter/Oil combo to develop a nice brown crust on the outside. 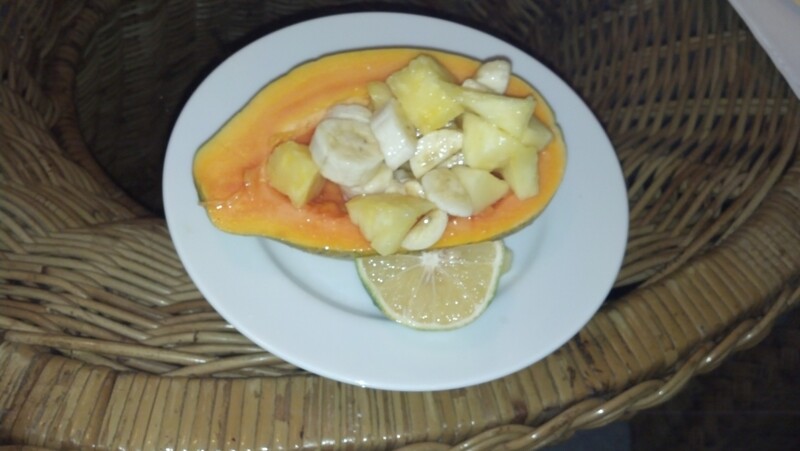 We ate it with Coconut Syrup for Ev and just Sugar for myself. This was a very good breakfast and we even had a slice leftover for a snack later in the day. The second Breakfast that I made was Coconut Pancakes with Grilled Baby Pineapple. Unfortunately most of the Pineapple is now grown in the Philippines, but the Baby Pineapple that I purchased was grown on Kauai. (This was a Certified Farmers Market and all of the produce must be grown in Hawaii). The Pineapple was exceptionally sweet, but when you grill it in a little Butter the sweetness is brought out and becomes intensified. 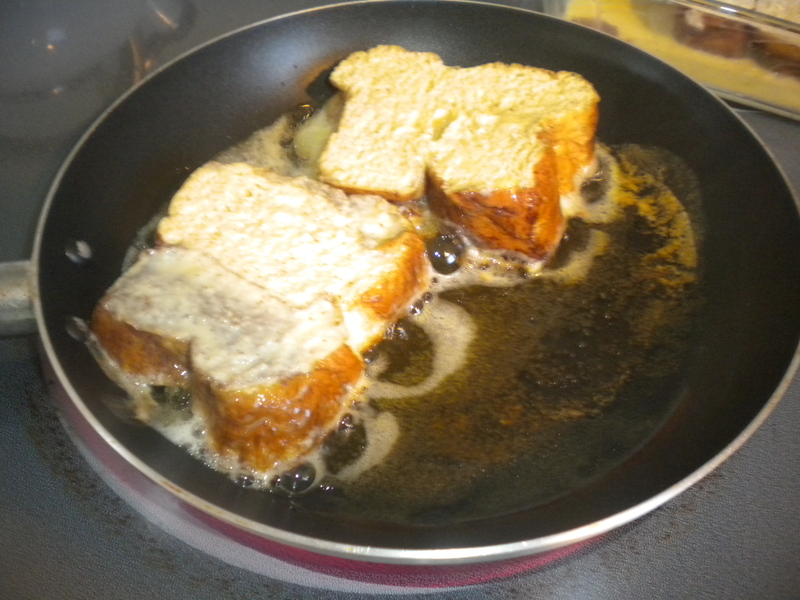 To give it just a little caramelization I used a small amount of Sugar in with the Butter. 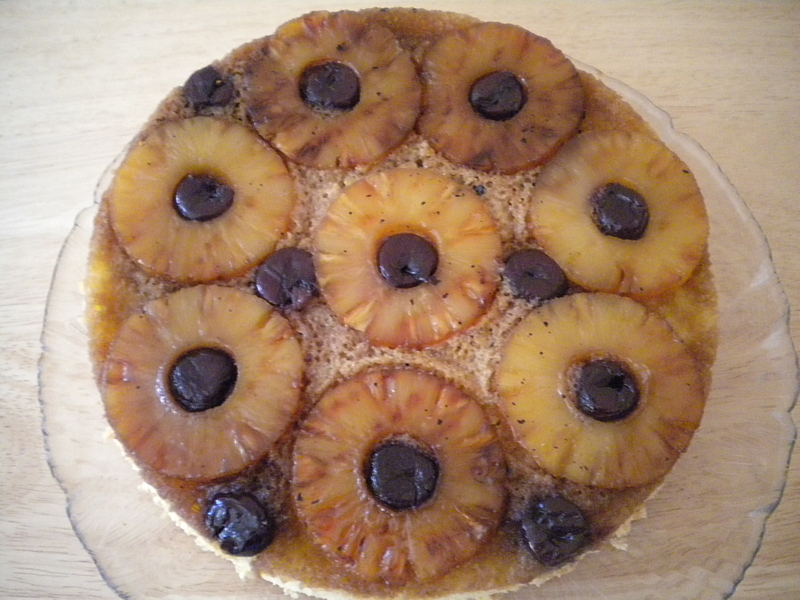 Not only did it give a nice golden/brown color to the pineapple but it did fortify the flavor of the pineapple. 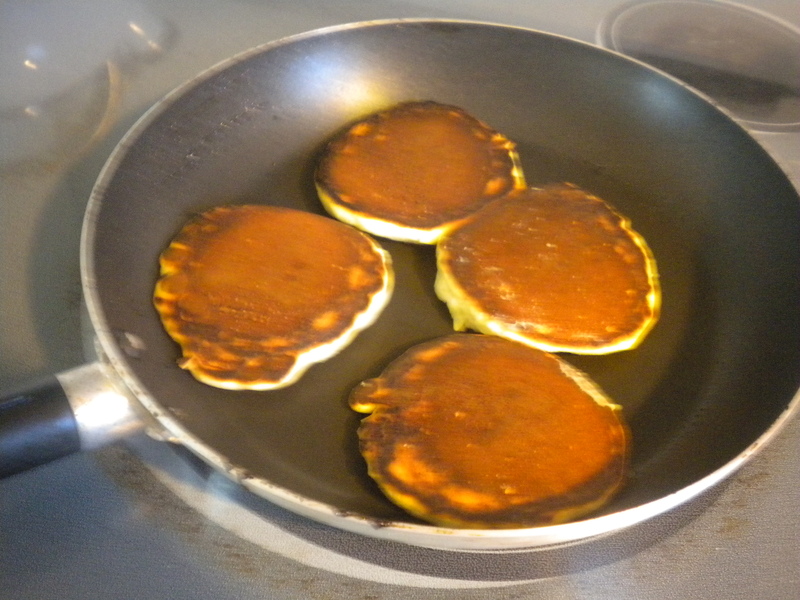 Usually I make my Pancake Batter from scratch, but since we were on the Island only for 10 days, I did not want to start buying a lot of ingredients that we would not use. So therefore, I purchased a bag of Coconut Pancake Mix. The directions on the package said to add only water, but I never pay attention to that. We want our pancakes to have a lot of flavor and nutrition, so I added an egg and used milk instead of water. 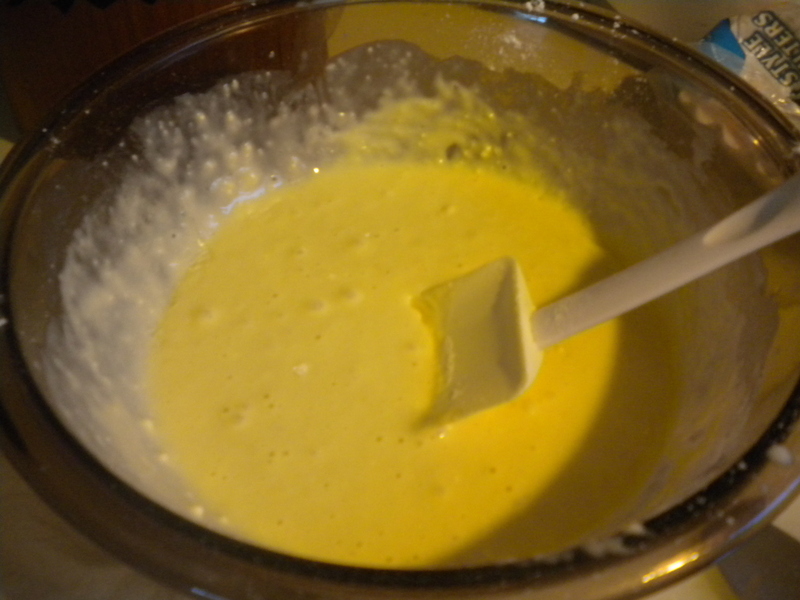 I also added a small amount of melted butter to the batter. 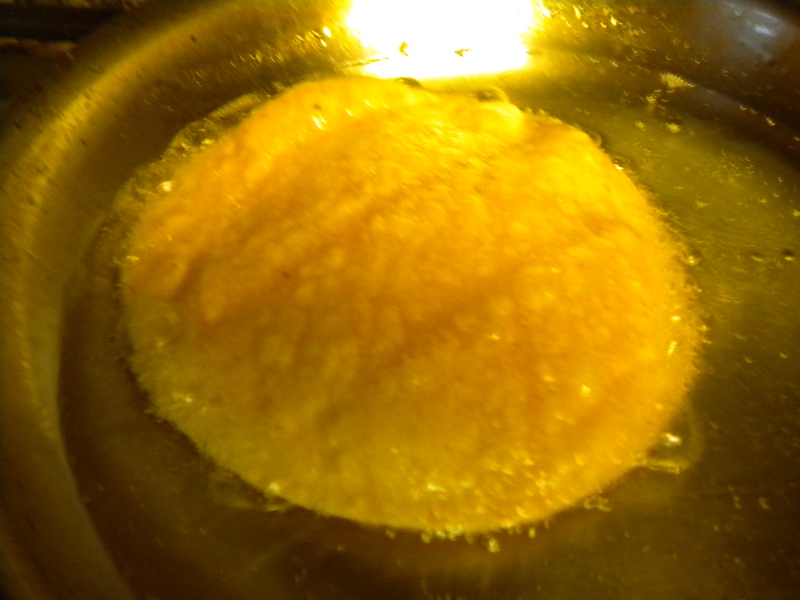 In the photo of the batter you will see some small lumps. Pancake Batter should never be beaten until smooth. This will cause the panckes to be tough! You will notice in the photo below that the Pancakes were cooked in a skillet rather than a griddle. When renting condos, you have to make do with what is available unless you want to bring your own equipment. Next time I am definitely going to bring my own knives, because the knives that were there were barely functional. 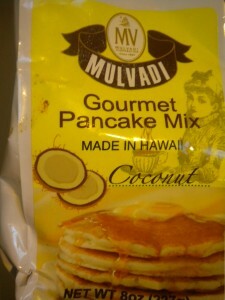 The pancakes were delicious with the Coconut Syrup (made in Hawaii) and the grilled Pineapple Chunks. The rest of our breakfasts were cereal, eggs and bacon, etc. 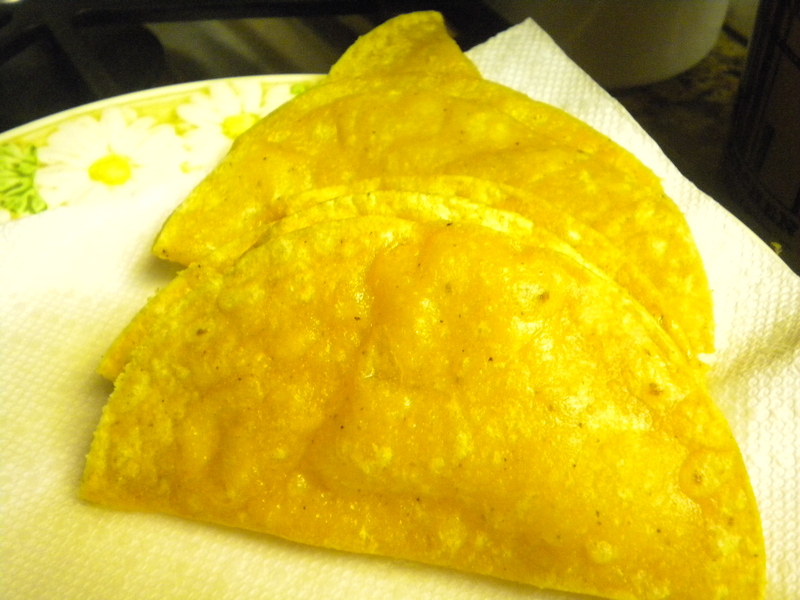 Most of our dinners were eaten out, but I did cook on some of the evenings. One night for dinner we had a Huli Roasted Chicken from the market. 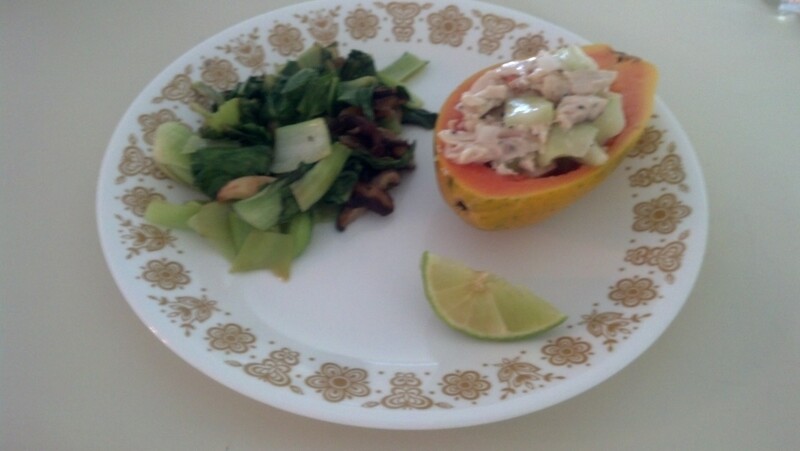 Since it was too much for two people to consume at one time, I saved the Breasts and made a Chicken Salad in Papaya Boats for dinner the next night. I put diced Maui Onion and Celery into the Chicken and dressed it with Papaya Seed Dressing. Along with the salad we had sautéed Baby Bok Choy (from the local Farmer’s Market in Hanalei) with Ginger and fresh Garlic. The next night we had sautéed Ono with Shitake Mushrooms and a Green Salad with Papaya Seed Dressing. 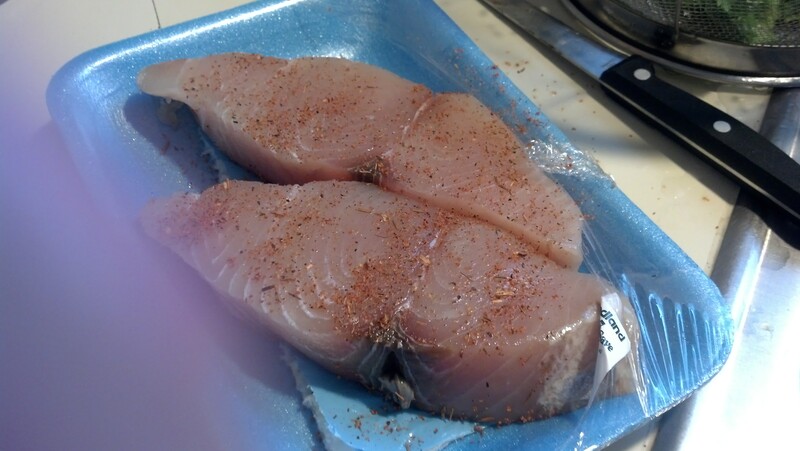 I sprinkled the Ono with a Hawaiian seasoning mix and let it sit for about 15 minutes. 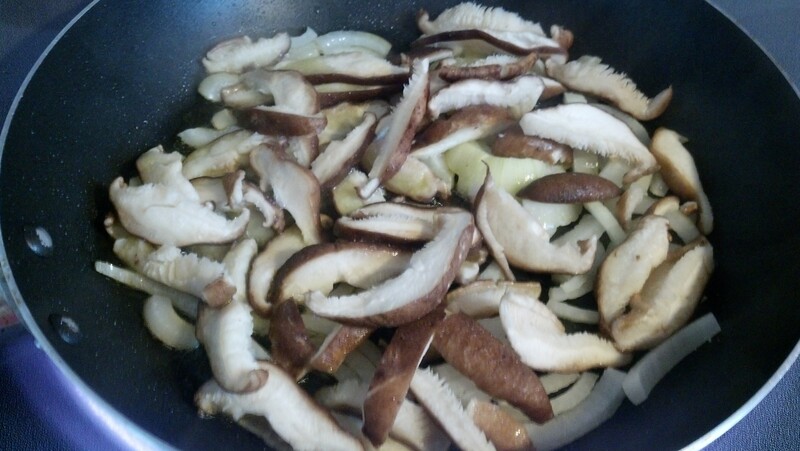 Next I sautéed Shitake Mushrooms with some Ginger and fresh Garlic. When the Mushrooms just started to soften, I pushed them aside and added the Ono which I lightly sautéed on each side. Ono is such a good fish and this was so fresh that It did not need to be cooked all the way through. Just browned on the outside and pink on the inside is the way to go! For an added boost to the sautee, I added just a touch of Sesame Oil at the very end of the cooking. For dessert we had Pineapple/Coconut Ice Cream with Chocolate Cake. 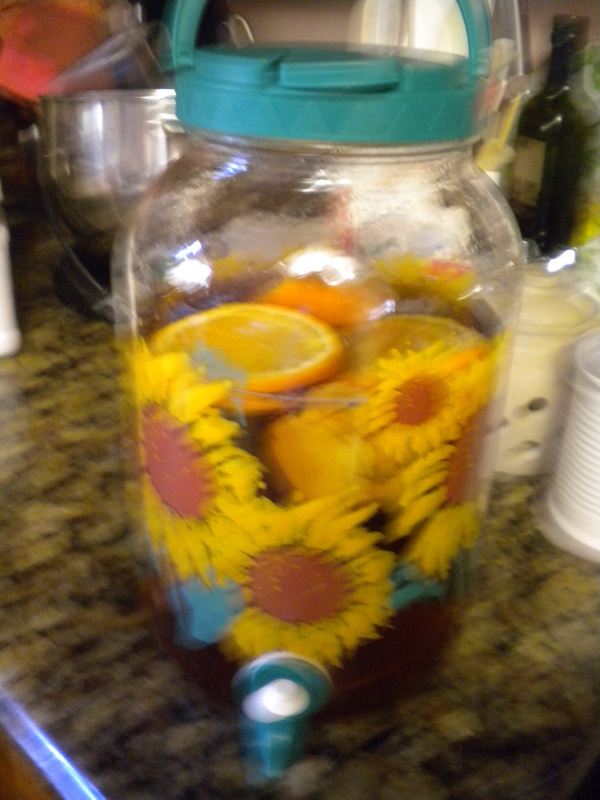 Our beverage that night was Hawaiian Sun Tea which I made by placing some Tea Bags in a pitcher of cold water along with lime slices. This was put out on the balcony table to brew under the sun. 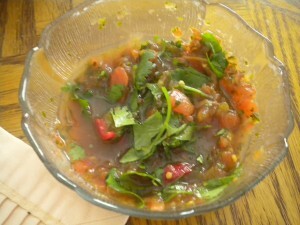 One of the items that we ate, but did not cook was a classic but made in an unusual way. This was a Bacon/Lettuce/Tomato and Avocado Sandwich on a Taro Brioche. 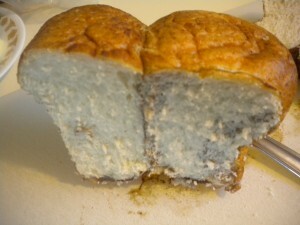 What was unusual about it was of course, the Taro Bun, but in addition it was made completely to order. 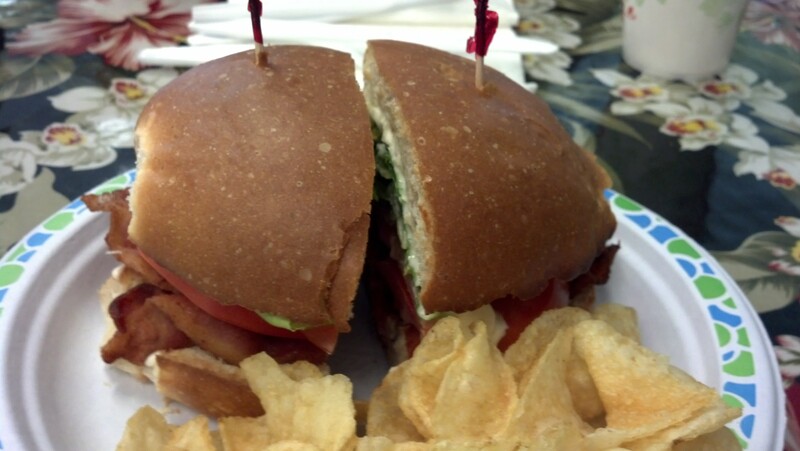 The Bacon was cooked just for our sandwiches and the Tomato and Avocado were sliced to order. We did have to wait about 15 minutes for our sandwiches, but they were well worth it. 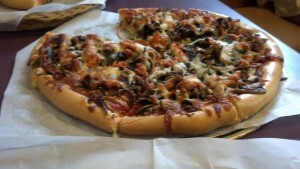 One other food item that we ate out was Pizza at the Bakery in Kilauea. 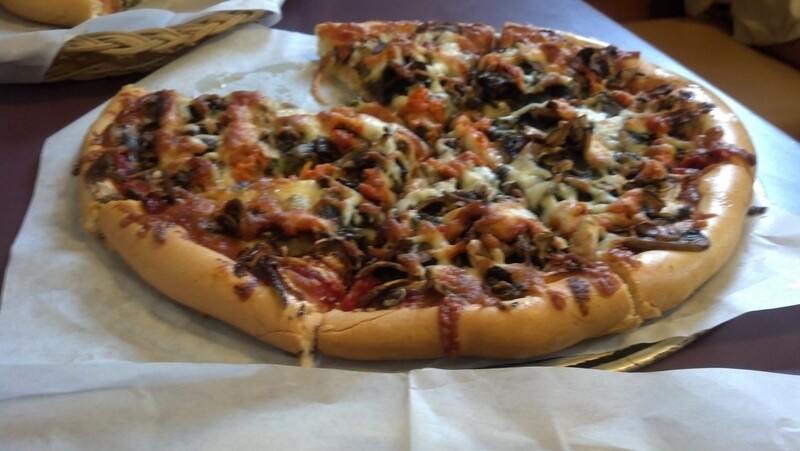 They make excellent pizza and we have been going there for years every time we go to the North Shore of Kauai. We had a pizza dressed with Sun-dried Tomato Pesto and Basil Pesto with Pepperoni and Mushrooms and of course Mozzarella. 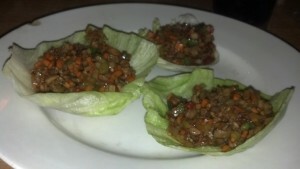 One day in Ka Paa I had Lettuce Tacos at Pacific Bistro which is now actually a Chinese Restaurant. 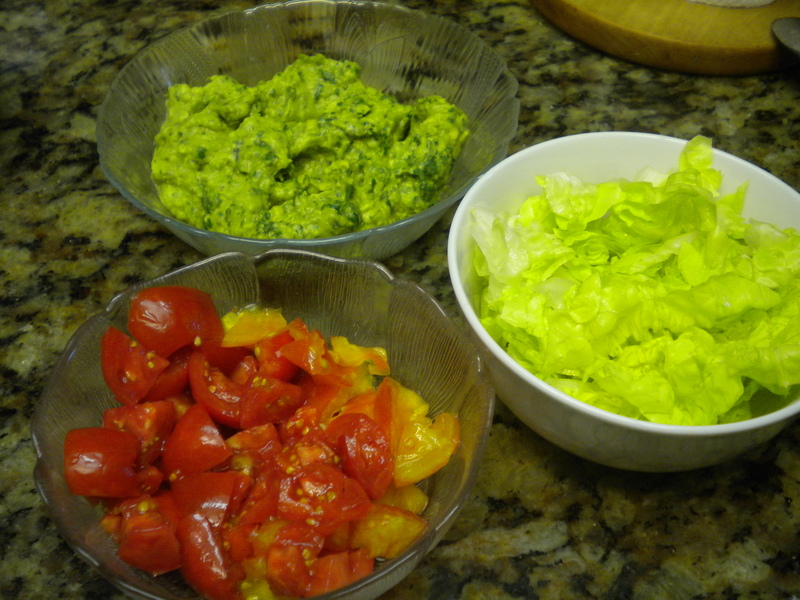 The Lettuce Tacos were actually what is known as lettuce wraps, except the lettuce wasn’t wrapped; it was actually just little lettuce cups. The other two places that we ate at that were noteworthy was the restaurant at the St. Regis Hotel (formerly Princeville Hotel) and the Lighthouse Bistro in Kilauea. For dinner at the St. Regis we had Steak with a Burgundy Mushroom Sauce, a very tasty Sweet Potato Dish, sautéed Spinach and a delicious dessert cobbler made from Mango and Strawberries. At the Lighthouse Bistro Ev had Shrimp in a Coconut Sauce over Linguini and I had a steak again. 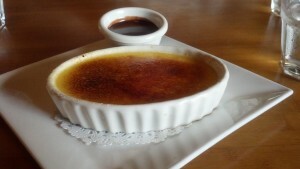 Dessert was a Passion Fruit Crème Brule with Chocolate Sauce on the side for Ev. Aside from the food our vacation was a success as usual. 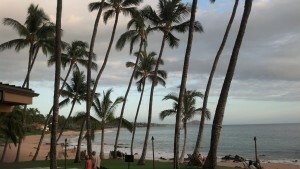 We enjoyed the ambience, the sweet smelling Hawaiian Fragrances, the balmy breezes and our gorgeous ocean view. It is Friday and we have gone through many culinary avenues this week and do not wish to repeat anything, so it is time for Chicken. We both love fried Chicken, but since the weather is warm and I really did not want to start frying anything, we decided on Chicken Salad. Since all we needed for the salad was enough chicken to feed the two of us, I decided on purchasing a chicken breast rather than the whole chicken. Since it was only a breast that we needed, I decided to splurge and purchase a free range organic chicken breast. The difference in flavor and moistness, between this type of chicken and the normal supermarket ones is astronomical. The organic, free range chicken reminds me of the chickens that we used to get delivered years ago when we lived in Granada Hills. A poultry company called Bob’s Poultry use to deliver Chicken and Eggs directly to our home and there was nothing like those chickens. They were so good! In those days, I had to cook at least 2 Chickens at one time! Later on it was three! Along with the Chicken Breast I purchased some white corn and an Orange Honey Dew Melon and some Croissants to go with the meal. To make the Chicken Salad I poached the Chicken Breast in some Madera Wine with fresh Pineapple Sage Leaves, fresh Greek Basil and freshly cut Chives. All the herbs were direct from our garden. I placed the Chicken Breast in the poaching liquid, brought it up to a simmer and cooked them for about 10 minutes and then shut the heat off. 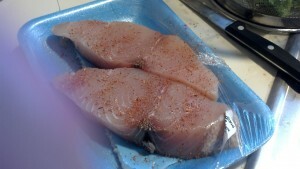 You can cut the breasts in half to make sure they are done or you can use a poultry thermometer. One hundred seventy degrees is more than done! Once the Chicken Breasts cooled off, I sliced them against the grain and then cut the slices into bite-sized pieces. 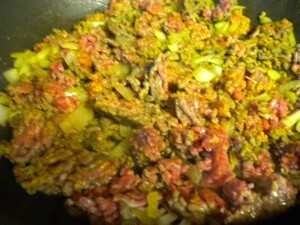 (The pieces were a healthy size, as I didn’t want pate.) 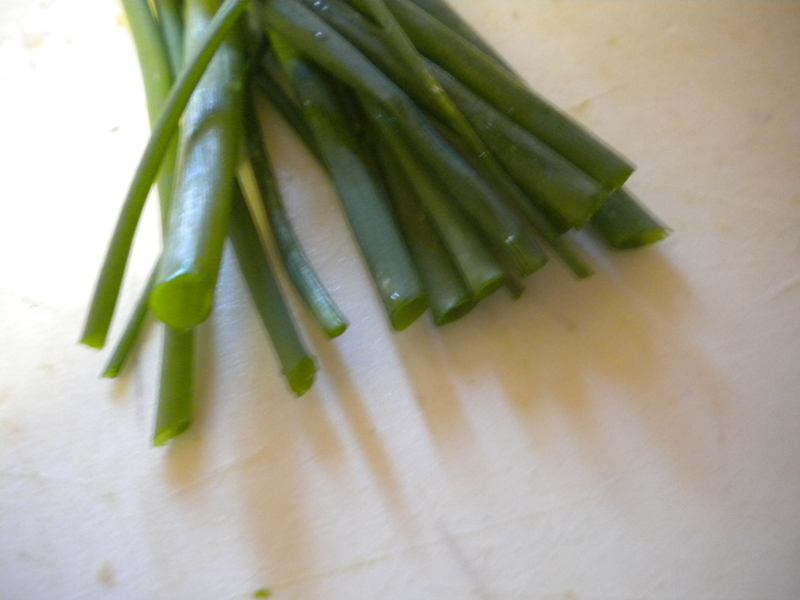 I washed and dried some celery ribs and cut them into bite-sized pieces. 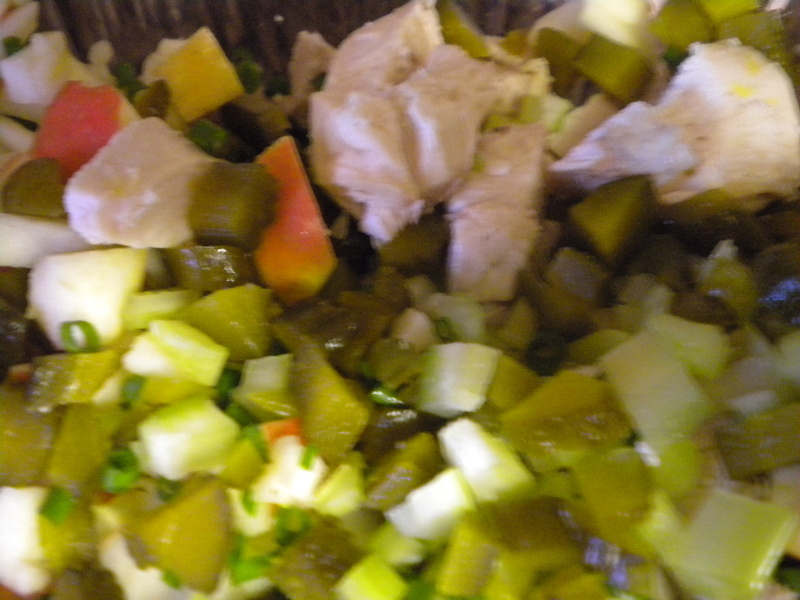 I cut the celery considerably smaller than the Chicken pieces as celery has a tendency to get stuck in between teeth. 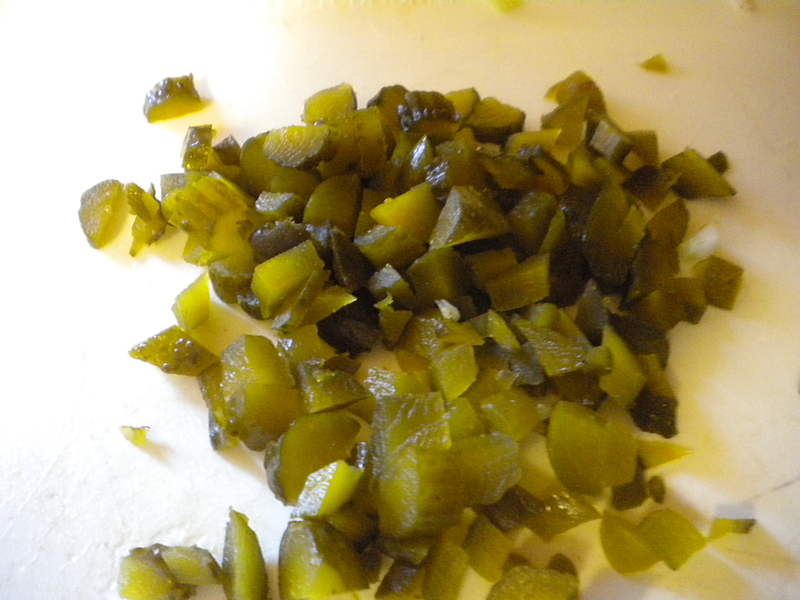 Along with the Celery were some more snipped Chives, Gherkin Pickles which I diced and a Pink Lady Apple, which I quartered, cored and cut up into bite-sized pieces. I leave on the skin, because the color adds a nice contrast to the white Chicken Breast. 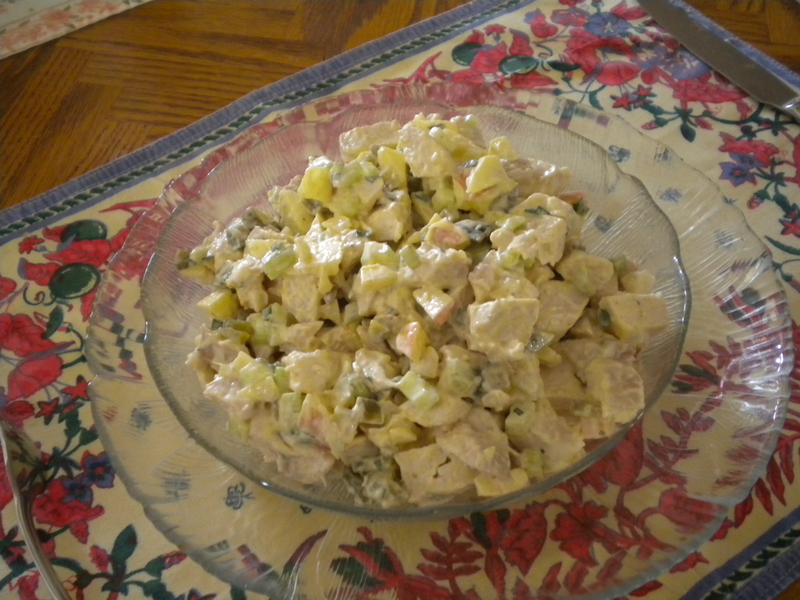 To season the Chicken Salad, I added ½ tsp. 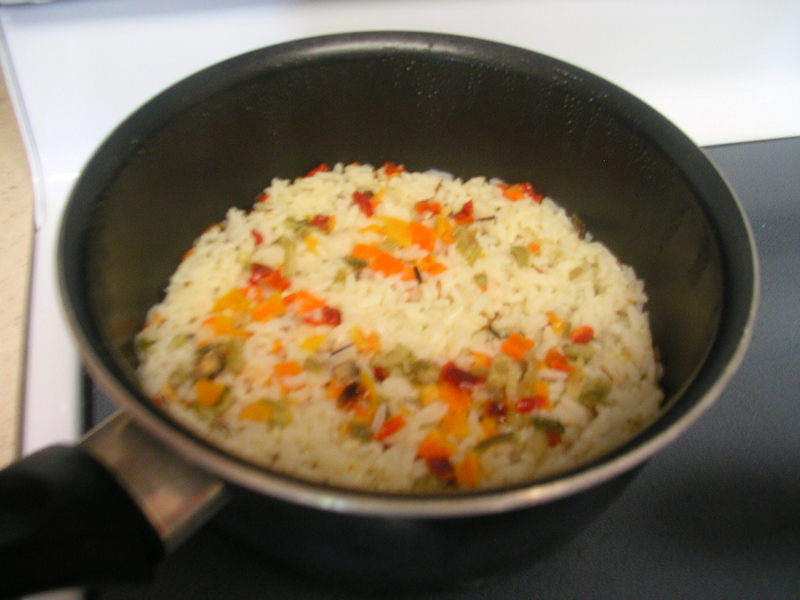 Salt, ¼ tsp. White Pepper, 1 tsp. 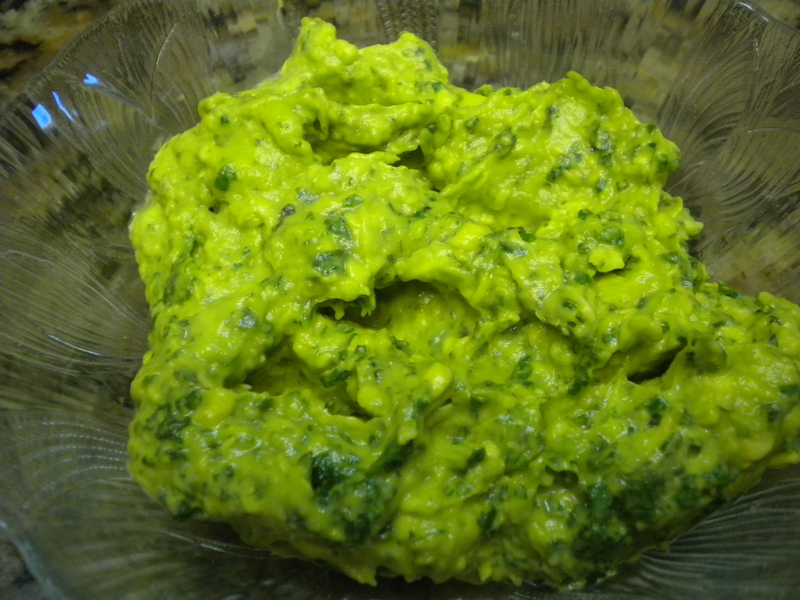 Curry Powder and approximately ½ cup of Mayonnaise. Ev husked the Corn and I washed it and made sure all the silks were off. To cook the Corn, I placed it in my steamer with water in the lower portion and steamed the Corn for 1 minute. 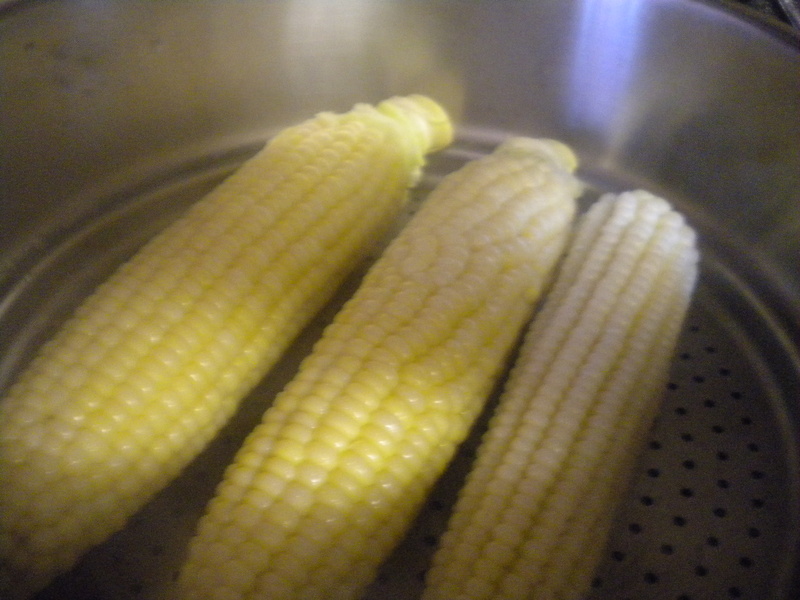 Young fresh Corn does not need to be cooked for more than 1 minute – all you want to do is to get it hot – young fresh corn even tastes good raw. In fact, I always taste it before cooking it to make sure it is sweet. 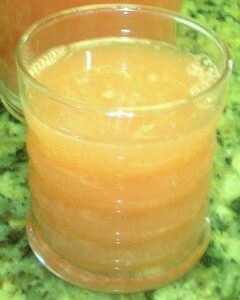 If it is not sweet you can add 1 Tbsp. Sugar and the Juice of half a Lemon to the Water and then just cook it directly in the water which should not be more than 1 inch deep. Again, do not cook it more than 1-2 minutes unless it is old and tough and in which case you should not even be eating it off the cob. For our Beverage we had Ginger/Peach Sun Tea brewed in the sun with orange slices and fresh ginger. 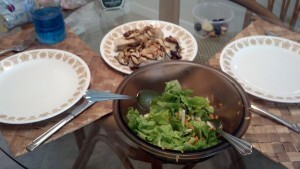 Dinner tonight was the Chicken Salad, steamed Corn and warmed Croissants. We decided to keep the Honey Dew for Sunday night when we would again eat the Chicken Salad, since I can never make just enough food for only 2 people. This was just one variation on Chicken Salad. There are hundreds of ways that you can prepare it. Chicken Salad can be an Hawaiian Variation, Chinese Chicken Salad, Thai Chicken Salad, and on and on. Just use whatever you have on hand and what you think will go well with Chicken. 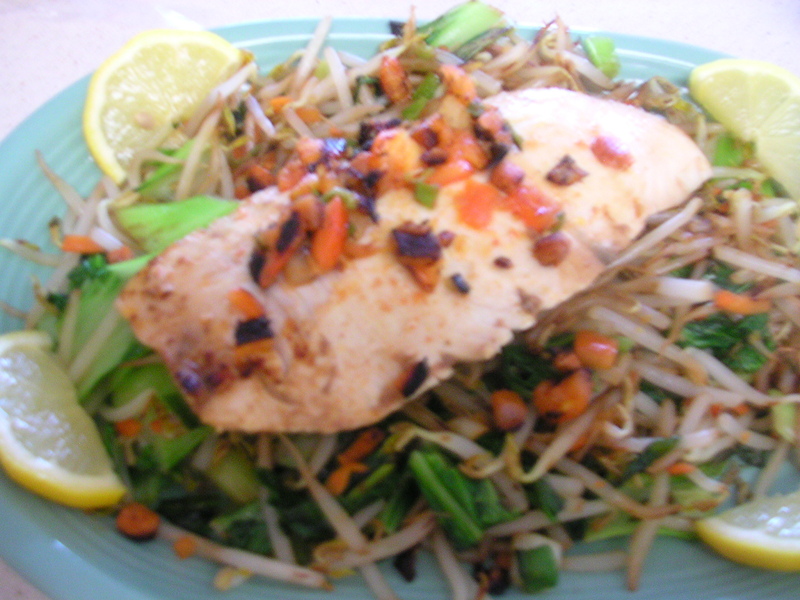 Don’t forget that Chicken Breast has somewhat of a neutral flavor that can be enhanced with most anything! Even nuts and noodles will work in a Chicken Salad! Today is Pineapple Upside Down Cake Day. Make one for your family! Or go buy one at the local bakery. That is if you like Pineapple Upside Down Cake. To make Pineapple Upside Down Cake you will of course need Pineapple. A 20 oz. Can of Pineapple Rings will do or you can buy a fresh Pineapple and cut your own rings. Fresh is always best, of course, but the canned variety will still give you a pretty good cake. Most recipes will call for Maraschino Cherries to be put in the middle of each piece of pineapple, but you can also use fresh (when in season) or canned Bing Cherries. Pecan halves can also be used in place of the Cherries or in addition to them. 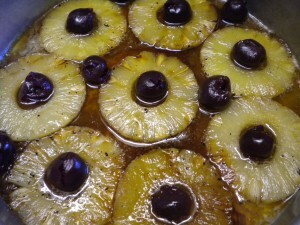 If you use canned pineapple and cherries, make sure they are blotted dry, otherwise your cake will be soggy. 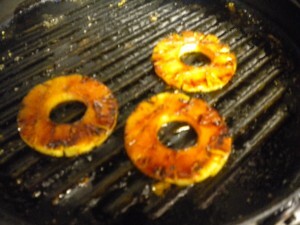 One nice way to make sure the pineapple has given up enough moisture is to grill the slices. 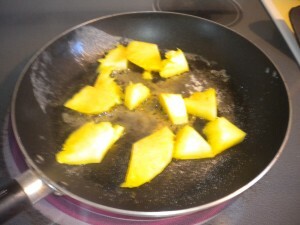 I did this on my stove top grill, but first I sprinkled the Pineapple Slices with Demarara Sugar (coarse brown sugar, sometimes called raw, which of course is not really raw). The Sugar gives a nice caramelization to the Pineapple. To make Pineapple Upside Down Cake, once your fruit has be prepared, you melt some butter in your baking pan, and then add brown sugar. 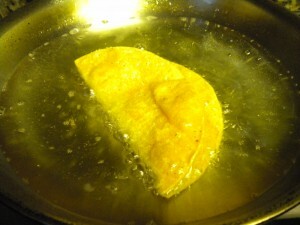 Spread the Brown Sugar evenly over the pan and then add the pineapple. Unless you would like to have chopped pecans as a finish for the cake, then you would add the chopped pecans before you add the pineapple slices. Once the pineapple slices are in the pan, then you add the cherries or pecan halves. The Cherries or Pecans Halves would go in the center of each piece of Pineapple and in between the slices, where there is room. Next you preheat your oven to 350 and then make the cake batter. 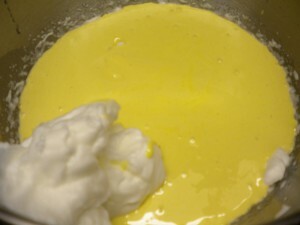 The best recipes will tell you to separate the whites from the yolks. The whites will be beaten until stiff and then folded into the prepared cake batter. This helps to make a light cake. Pineapple Upside Down Cake can be served warm with Whipped Cream or Ice Cream. It can also be served at room temperature or even cold from the refrigerator. Leftover Pineapple Upside Down Cake should be stored in the refrigerator as there is still quite a bit of moisture in the fruit and this can cause mold to form if left out. When your Pineapple Upside Down Cake comes out of the oven, give it about ten minutes to set up before inverting it onto a serving plate. To invert the cake, place your serving plate over the pan (be sure to use potholders if the pan is stillt too warm to handle) and then invert. Give it a minute ot two, to allow the cak to drop down, before removing the pan. You should have a beautiful Pineapple Upside Down Cake which will be ready to serve immediately or later on. Whichever way you make your cake and however you serve it, enjoy! And don’t forget, Pineapple Upsidedown Cake, leftover from dessert last night will make a great breakfast this morning! Today was another early rising day as we had decided to drive towards the northern end of Kauai to look for birds in the reserve in the Wailua River Valley. We also stopped to view the waterfall and to look over the Wailua River into the restored Hawaiian Village. It was a beautiful day and we had some good viewing. We also saw quite a lot of birds there as well. After our early morning sightseeing we stopped at Smith’s Tropical Paradise. 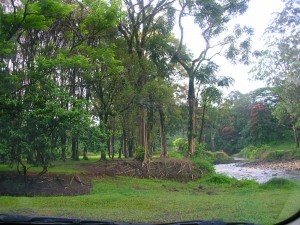 Their lush tropical gardens cover 30 acres of land; it is right next to the river. 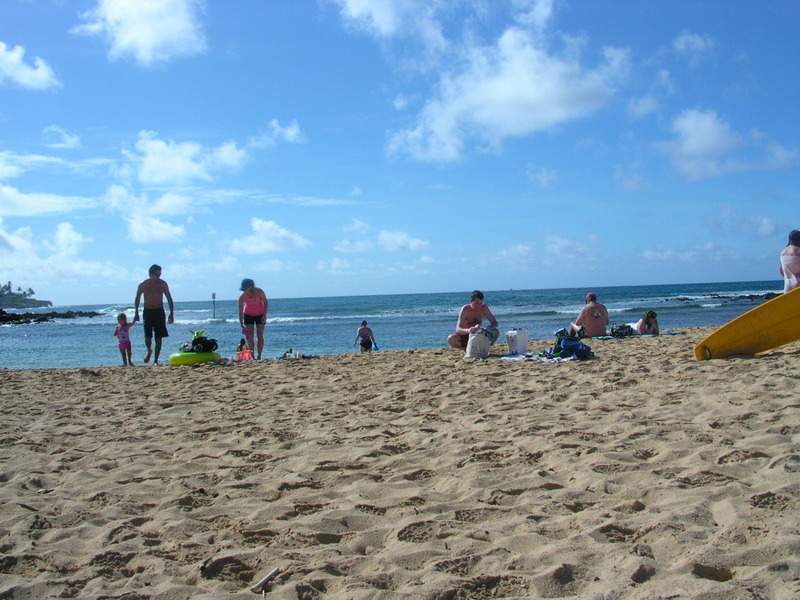 In the evenings they host luaus that anyone can purchase a ticket to attend. They also offer boat rides on the river. 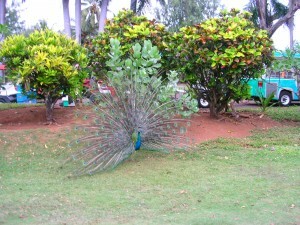 We saw quite a few different birds here but the most entertaining were the peacocks which of course are introduced birds. 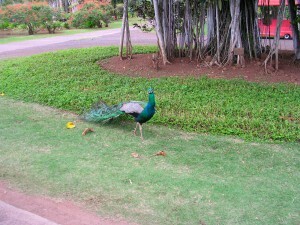 It is breeding season, the mails in all the finery strut around and around as if they were in a fashion show. 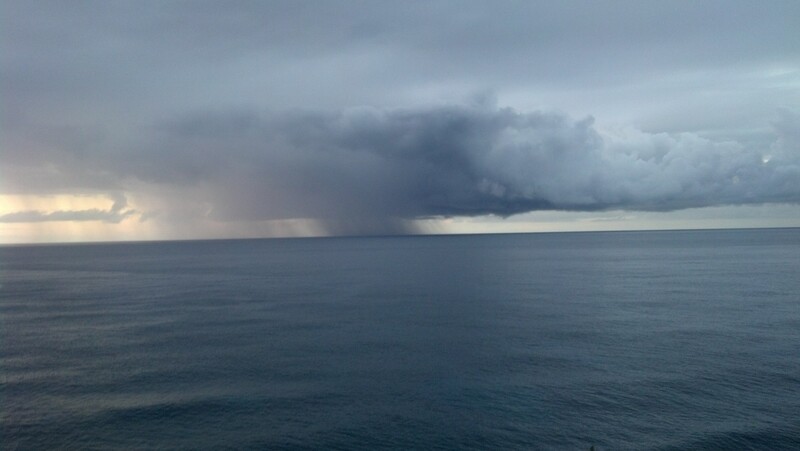 (Will put up a video of one on U-Tube). Back in Poipu we went to the Poipu Shopping Mall for lunch and tried out the dogs at Puka Dogs. The most outstanding thing about this eatery is all the different toppings that they provide for their dogs. Ev decided on the Polish Dog with Coconut Relish and I had the Polish Dog with Mango Relish. Their Polish Dogs taste more like regular hot dogs. I normally don’t like Polish Dogs, but their regular hot dogs were veggie dogs and that didn’t sit too well with me. I like my hot dogs to be made with beef. The best thing about this eatery was their fresh made-to order lemonade. It was very good. 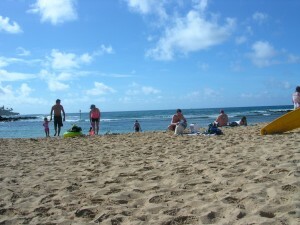 To see Puka Dog’s Menu go to http://www.pukadog.com/menu After lunch it was more beach time. For dinner this evening we went back to Kalapaki Joe’s and tried out a couple of their menu items that featured fresh lobster. Ev had the lobster burrito which was quite large and contained more than an ample portion of lobster. I had the lobster salad and it too had an ample portion of grilled lobster with a variety of vegetables and was topped with grilled pineapple slices. 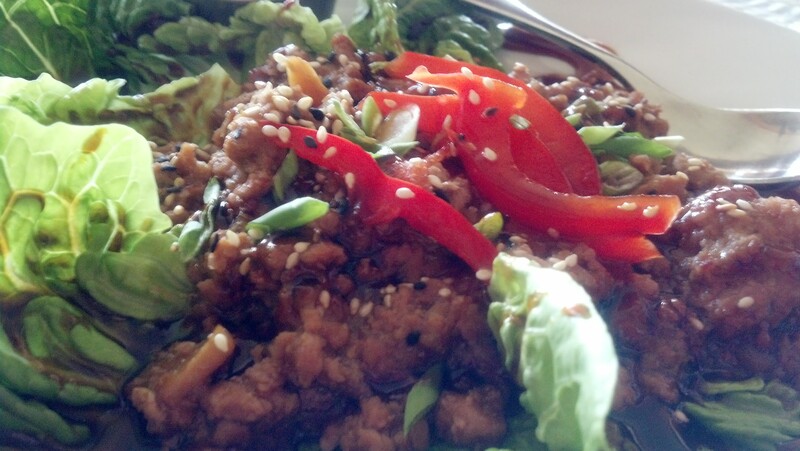 This salad came with a wonderful sesame dressing which was absolutely perfect. After dinner we walked back to the condo and spent some time outside on the grounds to soak up what was left of our time on the island. 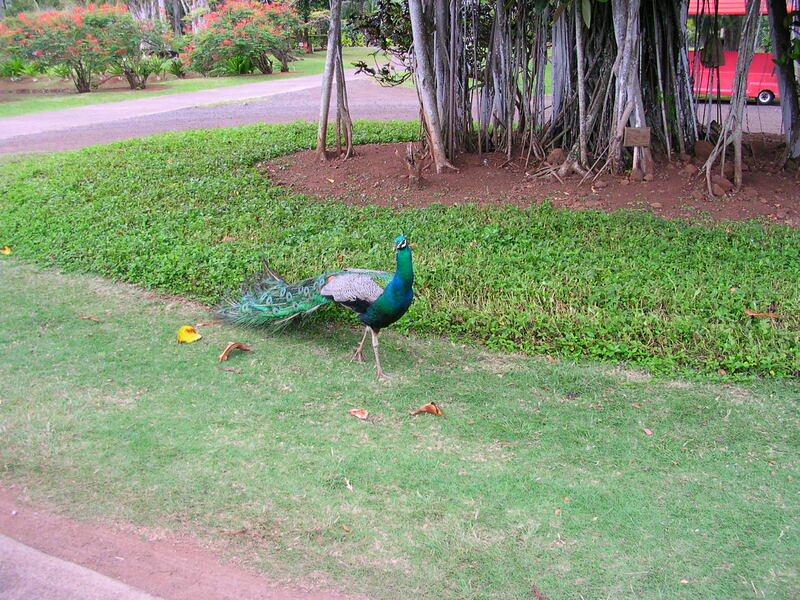 Kauai is a very peaceful place with beautiful scenery. With the gentle breeze, you feel like you are being bathed in silken strands. It is a wonderful feeling and one that you can carry with you in your memory for a long time afterwards. Day Seven was Saturday and again, I will skip breakfast as that wasn’t notable. For lunch we had a combination plate (items purchased from the market) of Tako (octopus) Poki Hawaiian Style Ahi Poki and Lomi, Lomi Salmon with seaweed snacks and sliced cucumbers. This was a very tasty and light lunch and it was completely satisfying. It met both flavor criteria and a minimum of calories if you are watching your weight, yet after eating this we felt completely satisfied and not the least bit hungry. Poki and Lomi Lomi is made with marinated raw fish. 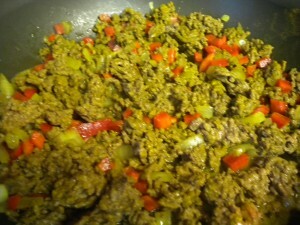 The marinating takes the place of cooking and the other ingredients such as onions and chilies add flavor. 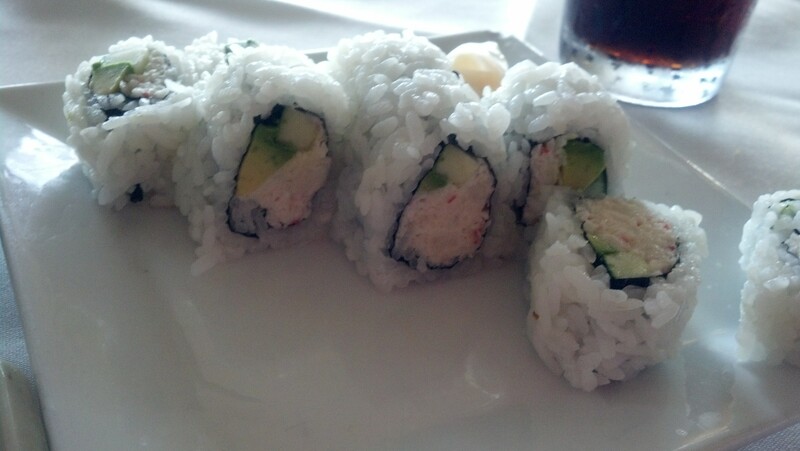 If making these dishes at home, only use the freshest of fish or fish that has been labeled Sushi quality. In the photo below, the dish in the upper right is Tako Poki, next to is the Lomi Lomi Salmon. 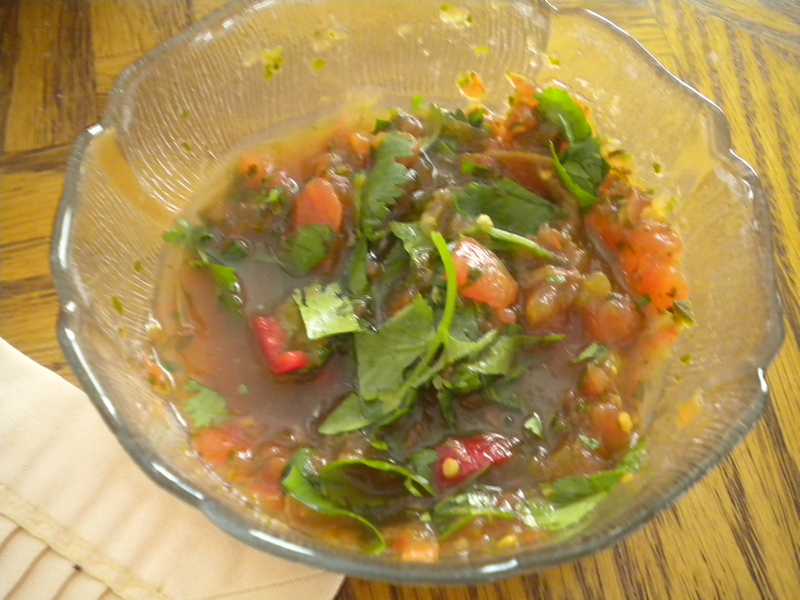 Lomi Lomi is usually pretty mild in flavor. In the lower half of the picture is the Ahi Poki; the Ahi was Hawaiian Style and had lots of flavor but practically no heat. The Tako on the other hand was spicy. For dinner we purchased some Ono from the market and cooked it Island Style with Soy Sauce, freshly grated Ginger, Sesame Oil and the leftover Lomi Lomi Salmon. 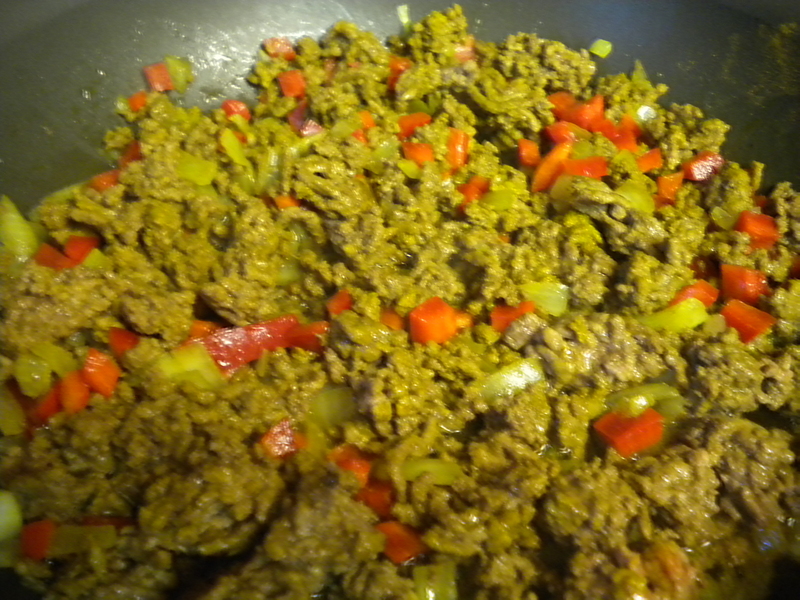 To make it, I heated up the pan and added the Lomi, Lomi, a little sesame oil and the ginger. 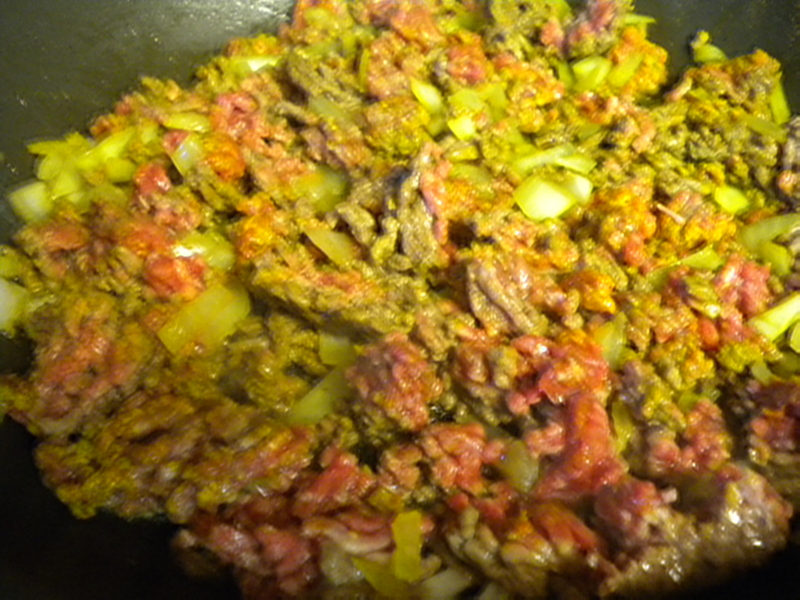 Then I cooked the ono on each side (it doesn’t have to be cooked all the way through) and added the soy sauce. Along with the Ono we had [amazon Jasmine Rice purchased a bag of Jasmine Rice that contained sliced, dried carrots and other vegetables. Along with this I sautéed some Baby Bok Choi, Scallions and fresh Basil. This made a very tasty meal. 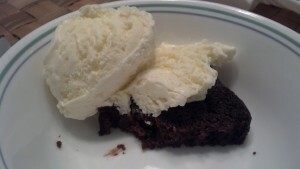 Dessert again was Brownie Bites and Ice Cream Sandwiches. Additional pictures of our food preparation can be viewed on Flicker. 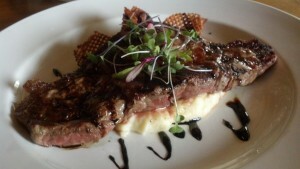 Click on the Flicker Link and look for Kauai Food Pictures. Today was Sunday so we decided to have breakfast out again at Burgers in Paradise. As mentioned earlier, this restaurant offers a lot more than Burgers and provides quite a variety of breakfast items. Ev had Pancakes which were rather large but quite good tasting. 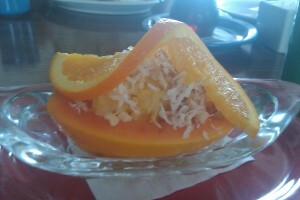 My breakfast was a Papaya /Pineapple Boat that was served with toasted coconut and chopped macadamia nuts. The boat was a very healthy and tasty breakfast. We both enjoyed cups of Hawaiian Coffee with the meal. After breakfast we returned to the condo and then to the beach for more sun, sand and surf. For lunch, we ate the leftover stir-fried vegetables with what was left of the Tako and Ahi Poki. So far, our meals have been quite healthy and tasty. 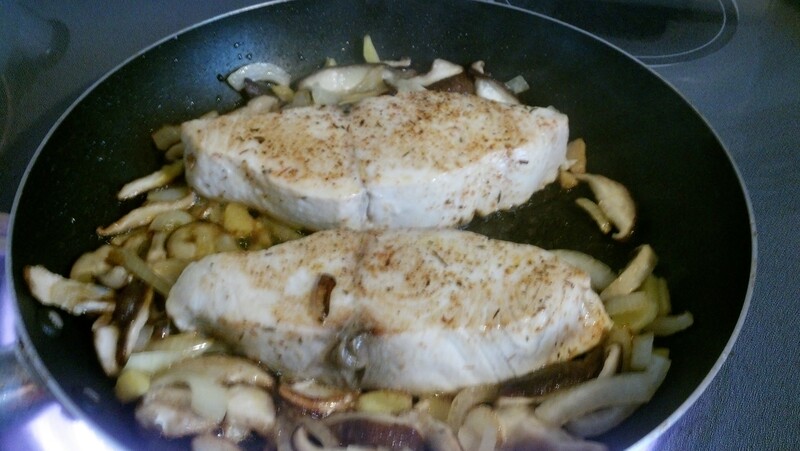 Eating good fresh fish with perky seasonings is really a good way to go, whether you are looking to lose weight or to just have a healthy, tasty and satisfying meal. For dinner this night we decided to try Brennecke’s Broiler. We have been to Kauai many times, but never actually ate at this restaurant as we usually stay at the North Shore and don’t like driving at night between the North and South Shores. The main restaurant is upstairs with a great view of the ocean and beach just across the street. The restaurant features both steaks and seafood and since by this time we had just about had our fill of seafood we decided to go with beef dinners. Ev ordered the Prime Rib and I ordered the Rib Eye Steak. Both these items are basically from the same cut of beef, but one is roasted whole and then sliced and the other is cut into steaks before cooking. Both dinners were served with rosemary mashed potatoes and the Rib Eye was served with a mushroom wine sauce. The Prime Rib was served with au jus and horseradish. Since Ev doesn’t like horseradish, I used that on my steak along with the mushroom wine sauce. When we finished dinner there was an unexpected downpour (typical of tropical climate) so we waited it out in the downstairs portion of Brennecke’s where we purchased a few items for our breakfast ‘on the go on’ Monday morning. 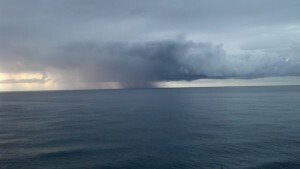 After about 5-10 minutes the rain let up enough for us to make to the car without getting wet. We shortly arrived back at the condo for another relaxing evening in Paradise.